Our online SkinMedica store is always open, and you’ll always save when you shop with us. We cannot wait to give your skin the pampering it deserves! Don’t miss out on a full range of superficial peels that help your complexion appear more uniform and renewed – diminishing the appearance of fine lines, wrinkles and roughness. Call Kelly today at 804.897.2100 x1188 OR fill out the form below and Kelly will contact you to reserve your spot. Don’t miss our FIRST EVER Love Your Skin Event on April 11th. We are proud to offer SkinMedica as part of The Renewal Center at VPFW. Whether used alone or as a complement to another treatment such as Botox or CoolSculpting, we feel confident that you’ll love your results. SkinMedica is an innovative skin care line that uses science and clinically-tested ingredients to address an array of concerns, including sun damage, signs of aging, acne, and more. We would love to speak with you about your concerns and goals and work together to develop a customized skin care regimen that’s just for you. Of course, if you already know exactly what you want, that’s great, too! Our online SkinMedica store is always open for business, and we always offer products to you at 10% off MSRP. 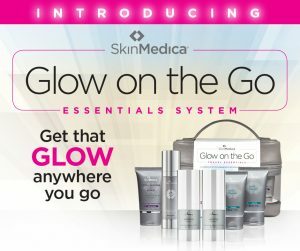 Right now the spotlight is on SkinMedica’s Glow on the Go kit. Formulated to deliver smooth, RADIANT skin and stocked full of fan favorites. SkinMedica® Glow on the Go Essentials System helps your patients GET THAT GLOW, even on the go. This convenient, all-in-one kit features the LUMIVIVE™ System and HA5®Rejuvenating Hydrator, and is available to you as part of a not-to-be-missed promotional offer. All of this for $199 when it is valued at $500! Give Kelly a call at 804-897-2100 ext. 1188 and order your Glow on the Go today!